The Tamashii Webshop has posted a pre-order page(time to get nice with your connects in Japan!) for the Metal Build 00 Raiser Renewal Color/Markings Version. This release bundles the Metal Build 00 Gundam with the Metal Build 0 Raiser with new paint and markings supervised by designer Kanetake Ebikawa. Pre-orders in Japan started on March 22nd. These are made to order and in addition, are hand painted! TamashiiWeb has therefore stated that there may be some slight variations in the paint applications. 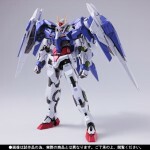 Metal Build 00 Raiser is planned for release in August for 18,900 yen. It stands approximately 180mm tall(1/100 scale) and is made of ABS, PVC, and of course, diecast metal. Click on the headline to check it out.